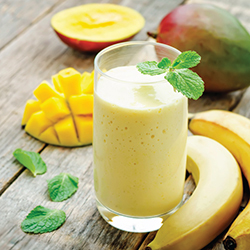 The perfect tropical combination of mango and banana blended together. Add all ingredients except ice to blender. Blend until smooth. Add ice and blend for 2 minutes until smooth. Strawberries and bananas are the perfect blend for your morning. 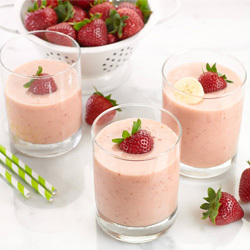 Combine strawberries, bananas, yogurt, milk and honey in a large blender container. Cover and blend on low until strawberries are chopped, increase speed and blend until smooth. Eat Healthy. Live Healthy. Be Healthy. That is the overall goal behind Full Circle, Fresh Market’s exclusive line of natural and organic products. Hopefully you’ve had the chance to try Full Circle and have seen how delicious and more importantly how affordable eating healthy can be. If not, then now is your chance to win some Full Circle product along with a brand new Blendtec ® Designer 625 blender (valued at $480). Now you can feed your passion in more ways than one because when you take great-tasting, high quality products made from only the finest natural and organic ingredients and mix that with the world’s most advanced blender (TM), and we literally mean mixing, your lifestyle will have gone Full Circle. So what are you waiting for? Return to a natural way of living and enter for your chance to win this great prize package. This green smoothie is jam-packed with fruit and spinach. One serving provides half of the RDA for vitamin C, a third of the RDA for vitamin A, and all of the RDA for vitamin K. Though this recipe is packed full of nutrients, it is low in calories.